When should Hijamah be performed? It is recommended that Hijamah be practised on the the specifically prescribed days Monday, Tuesday and Thursday. 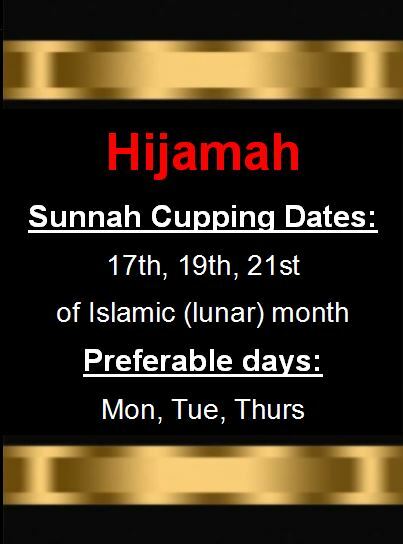 The recommeded days to perform Hijama Therapy are the 17th, 19th and 21st days of the Lunar Calendar providing these days coincide with Monday, Tuesday or Thursday. Very strongly advised against practicing Hijama on Wednesdays. “Hijama on an empty stomach is best. In it is a cure and a Blessing. It improves the intellect and the memory. So use Hijama with the Blessing of Allah (سبحانه و تعالى) on Thursday. Keep away from Hijamah on Wednesday, Friday, Saturday and Sunday to be safe. Perform Hijamah on Monday and Tuesday for it is the day that Allah (سبحانه و تعالى) saved Ayub (عليه السلام) from the trial. He was inflicted with the trial on Wednesday. What is the ruling for performing Hijama on Friday, Saturday, Sunday and their nights? There are narrations prohibiting Hijamah on these days. However, when one is sick or is in dire need then cupping can be performed on these days.